A tippee top, also known as a tippy top, is a type of top, patented in Britain in 1953, that consists of a peg with a ball-shaped body. 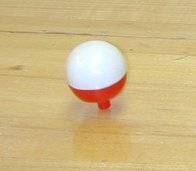 If the top is spun quickly on the rounded body, with the peg pointing upward, it flips itself over and spins on its peg. Crucial to this counterintuitive behavior is the shape of the body, which is smooth and spheroidal with no sharp point. After release, the top, like tops of every description, begins to show precession, i.e. its axis of rotation moves in a small circle. After a while, the contact-point of the top with the table no longer coincides with the rotation axis but instead moves to other points of the top's head. Due to frictional forces and precession the top seeks for a more stable position, which it finds by flipping on to its stalk.